Rajapaksa – alleged war criminal & autocrat – isn’t backing out from his claim to be Sri Lanka’s prime minister. On 26 October, Sri Lanka’s President Maithripala Sirisena, in a sudden move, sacked Prime Minister Ranil Wickremesinghe and appointed his erstwhile archrival, Mahinda Rajapaksa, in his place. Sirisena also announced that the alliance he leads, the United People’s Freedom Alliance (UPFA), would be leaving the ruling coalition that was built upon a power-sharing arrangement between the country’s two main political parties— the Sri Lanka Freedom Party and the United National Party (UNP). Domestically and internationally, it was widely known that the Sirisena-Wickremesinghe partnership was on the rocks. It was also known that Sirisena and his erstwhile nemesis Rajapaksa had been exploring the possibility of reuniting. But the news of Rajapaksa’s purported appointment – the move is clearly unconstitutional – has completely shaken up Sri Lanka’s political scene. Since Rajapaksa was appointed, Sirisena prorogued and later dissolved parliament; he also called for a parliamentary election to be held on 5 January. The Supreme Court subsequently put a stay on the dissolution until 7 December. It’s possible that the court could rule in Sirisena’s favour, although it now seems more likely that it would not. Besides, it would be good if this crisis were resolved before that. Sri Lanka’s current state is completely unsustainable. Sri Lanka doesn’t really have a functioning government. The crisis has already taken a toll in terms of the economy and tourism. Foreign aid and trade concessions are also in question because of Sirisena’s actions. Anything could happen, although it’s hard to imagine Rajapaksa backing away from his claim to prime ministership at this point. Sirisena too has painted himself into a corner. He was already unpopular and has never had a political base. It’s difficult to see him winning a forthcoming presidential contest; yet, if he doesn’t stay aligned with Rajapaksa, he doesn’t have a chance for a political future. A successful coup attempt would be devastating, but we aren’t there yet. Besides, the Sirisena-Rajapaksa alliance still wants a degree of legitimacy to cover their illegal and unconstitutional actions. Rajapaksa has already lost two no-confidence motions in parliament and it’s not clear what happens next. Sirisena convened a meeting to discuss resolving the crisis on 18 November, although it appears that little progress was made. It’s important to note that Rajapaksa and his supporters have been calling for an early parliamentary election to end the crisis (a parliamentary poll isn’t due until 2020). They, quite reasonably, suspect that they would win. So, a negotiated resolution to the crisis could result in an early vote. This would happen if parliament passed a resolution dissolving itself with the support of two-thirds of the House. However, moving for an election would be a risky move for the United National Party. On the other hand, an election would be far better than the conflict being decided in the streets. Even a supposedly unsuccessful coup might eventually result in Rajapaksa – an alleged war criminal, unreformed autocrat and incorrigible ethno-nationalist – coming back to power through ostensibly legitimate means. Let’s not forget how horrible Rajapaksa’s tenure was for the country, and particularly for the Tamils. When I lived and worked in Sri Lanka (from 2011 to 2014), I vividly remember the words “white van” being used as a verb – a revealing reference to the disappearance machine (people were abducted using white vans) that Rajapaksa brashly wielded. With Rajapaksa at the helm, Sri Lanka turned into a place where dissent was brutally crushed. Rajapaksa could have just waited and tried to come to power via constitutionally valid means – through scheduled national elections, in which he and his allies would have been favoured to win. 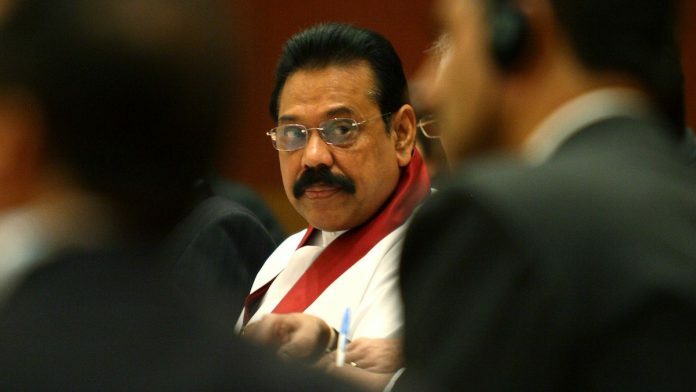 For some reason, he couldn’t wait, rumours abound as to why: A commonly cited explanation is that Rajapaksa is hoping to prevent the possibility of him or his family members eventually being held accountable for corruption, in the numerous ongoing cases. Others have posited that Rajapaksa’s plan has been to foment chaos and ensure that a parliamentary vote is held ahead of schedule. Irrespective of how things play out, it appears that Rajapaksa’s dark legacy is going to hang over Sri Lanka in the foreseeable future.